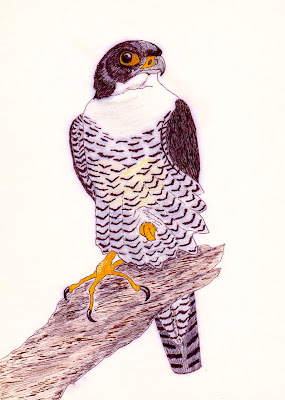 Unfortunately I have never seen a Peregrine Falcon close up, that's why I looked at one in a book to draw this effort. I hope to see one here Roy. Lovely work! Beautifully drawn....I hope you get to see a real one. Real nice Roy...you should put this on your Birdie blog too! Love this! The feet are fabulous, and I love the graphic feel of the feathers. You've really captured the eye/bill combo. Black detail on white tends to be easier to do than some colours. Roy, this blog is delightful and I will add it to my Kathie's Poet Tree blog roll! Love this painting!